Just in time for what is promising to be a very warm weekend, I have just the cool, refreshing drink you may be looking for. Lately I have been experimenting with putting together various combinations of fruits plus an alcoholic ingredient of some sort to make a cocktail that we can enjoy in the late afternoon out on our deck. Some have been very Yummy, others only Eeh…… This one, I think, is one of the successful ones. Try it, and see if you agree. 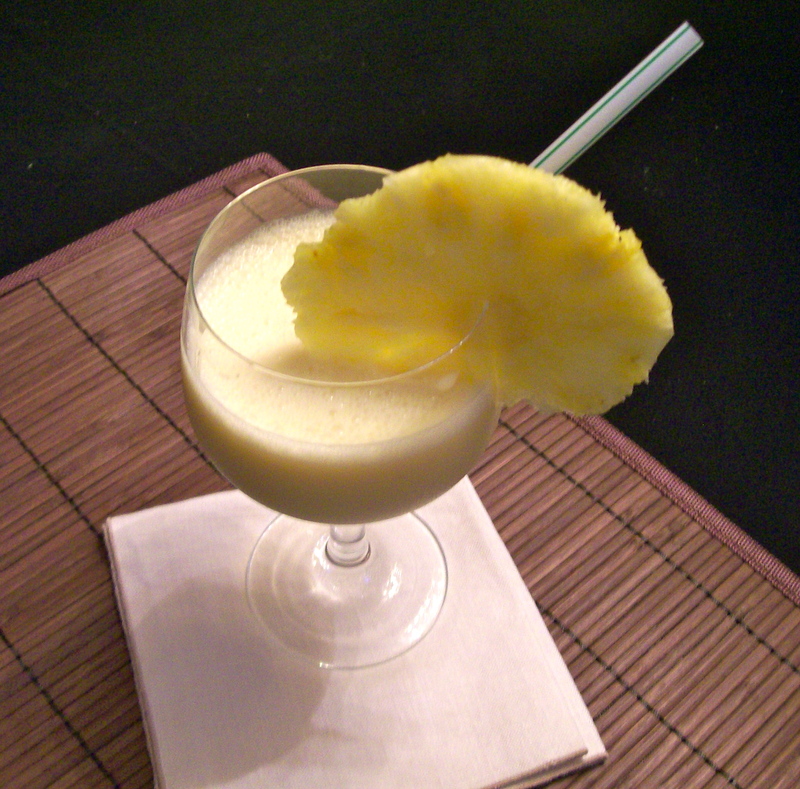 It contains pineapple, mango, and orange juice, plus dark rum. 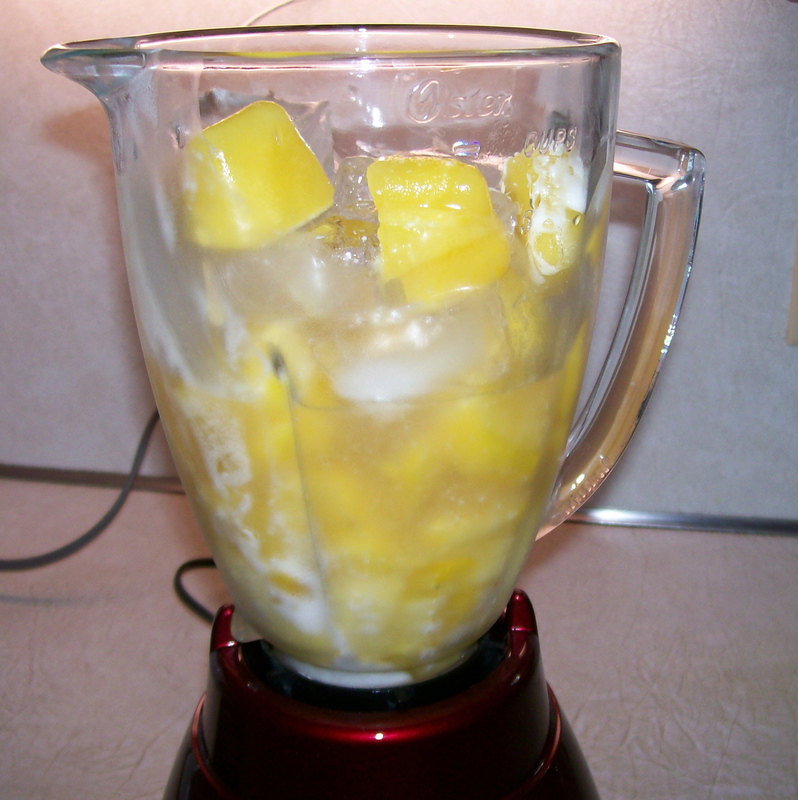 I freeze the pineapple in chunks, also the mango, and make orange juice ice cubes. When it is all blended together you get a thick, cold, frosty beverage that pretty much stays that way all the way to the bottom of the glass. Then you will want to pour yourself another one! 🙂 The riper the pineapple is, the more pronounced it’s flavor will be. My advice: If you do not have the ingredients on hand there is still time to go to the market and get them. Cut up and freeze the fruits, so when a hot day arrives in your neck of the woods, you will be able to zip up this drink in a jiffy. 1. Arrange pineapple and mango pieces in a single layer on a baking sheet; freeze at least an hour or overnight. Freeze the orange juice in an ice cube tray. 2. 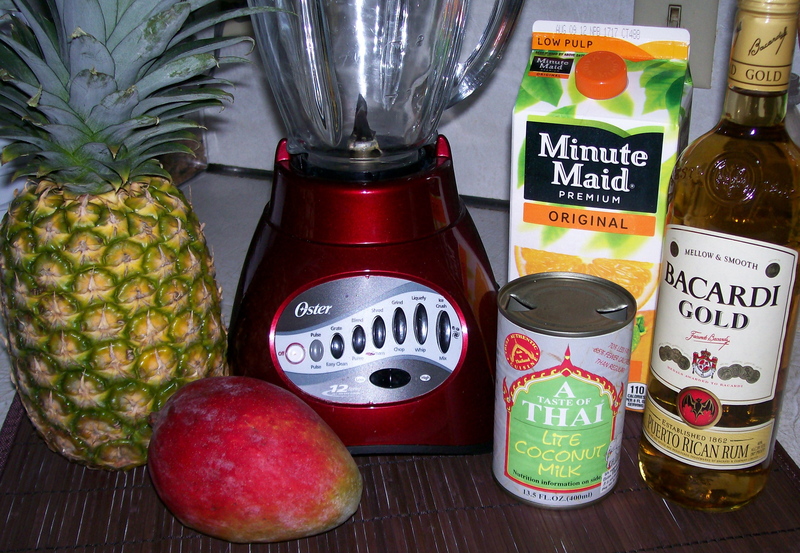 Combine pineapple, mango, orange juice cubes, ice cubes, agave nectar and rum in a blender; Process mixture until smooth. Add coconut milk slowly thru top “feed opening” while blending. Process just to incorporate. 3. 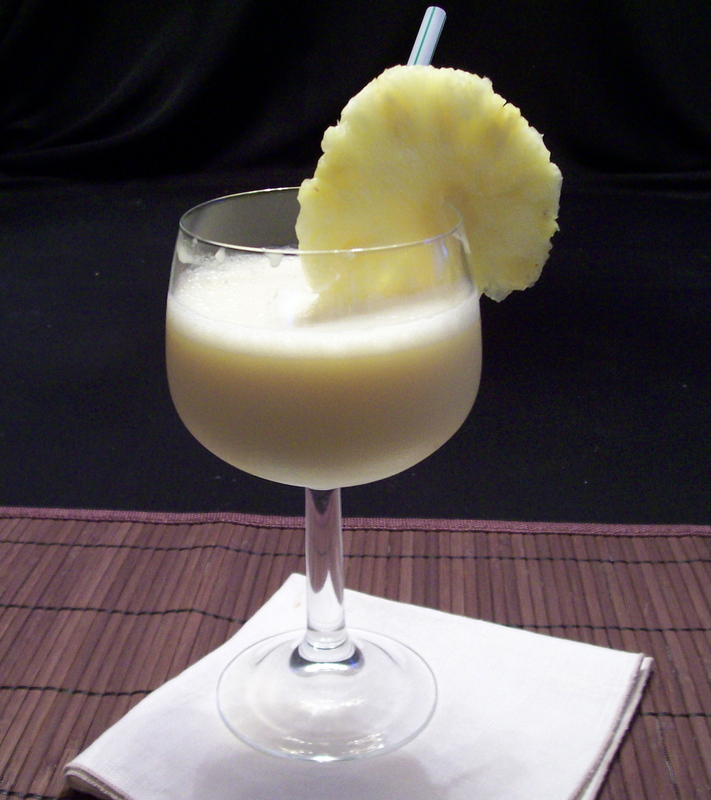 Serve with a pineapple slice to garnish. Some further thoughts: You may choose to omit the rum, and this would still be a cool, delicious drink. I chose to use “lite” coconut milk to avoid the saturated fat in the heavy, sugary cream of coconut. This also cuts the calories way down. I used a darker variety of rum because it’s what I had on hand. With its underlying hints of molasses and caramel it compliments the coconut and pineapple but you could use any kind of rum.